Hennessy Hanes knows better than anyone not everything is always as it appears to be. After years of being on the receiving end of her squeaky-clean preacher father’s abuse, she seizes an opportunity to leave it all behind and runs. This is the story of Tate and Hennessy, book 3 of the Hail Raisers. The Hail Raisers is a group of men that are employees of a Repo Company owned by the Hail Brothers. They are loosely associated with the other series written by this author. Each book, as well as each series, can be read as a stand alone, but are much better when you have already immersed yourself in the other series. Although Tate and Hennessy know each other from their childhood, circumstances prevent them getting to know each other more than in passing. Tate has always been a bad boy, in every sense of the word. He has just been released from prison and is seeing Hennessy as a condition of his parole. Hennessy is the only daughter of a preacher in their small town. She is quiet, reserved, and friendly. From the outside, her life seems picture perfect. But everything is not as it seems to be. There is undeniable chemistry between the two, but they try to ignore it, each for their own reasons. As the story unfolds, things come to light that throw them together, and make it impossible to ignore any longer. Together they bring out the best in each other, and fight to make their lives everything they know it could be. This story is heartbreaking at times, but there are just as many times where I couldn’t contain my laughter. The description is enough that I could picture myself there as the action was unfolding. And it was HOT! Definitely got my heart racing! 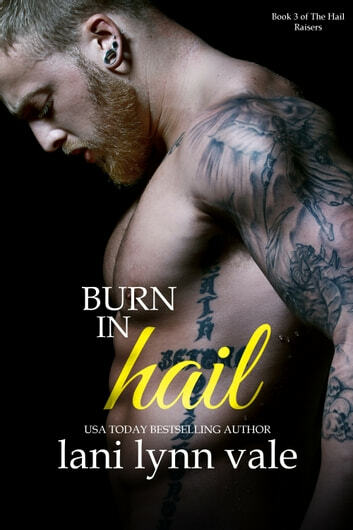 As with all of Lani Lynn Vale’s books, the story flowed well, and there was enough action to keep it moving, but didn’t overshadow the romance between Hennessy and Tate.